Color(s): Red, brown, black, white, gray, and yellow. May have Merle markings. The Mudi originated in Hungary and is a relatively new breed. 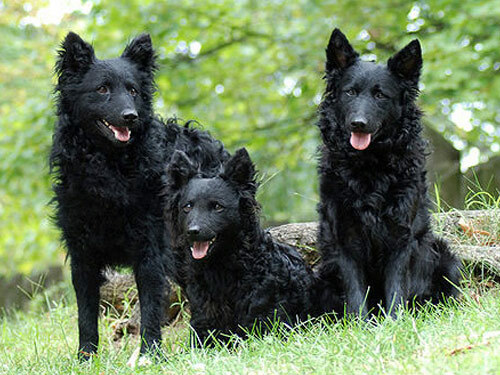 They are noted for their versatility as sheep herder, flock guardian, guard dog, cattle herder, hunter, and companion. Mudi's are also utilized as rescue dogs. This breed is exceedingly rare and difficult to obtain. A medium sized breed, the Mudi is brave, agile, and alert. They are robust, flexible, and reliable. The most distinctive characteristic of this breed is the head. Mudi's possess an expression of being attentive, intelligent, and dynamic. The Mudi is loving, gentle, and forms a close bond with one particular family member. They do not trust strangers and will protect and defend their family and property. The Mudi breed does well with children they have been raised with. They get along with other dogs and non-canine pets they have been raised with or properly introduced to. This breed possesses multiple talents and a pleasing disposition. Mudi's require occasional brushing to remove dead hair. Bathing should be done when necessary. The Mudi is a relatively healthy breed with some rare cases of Hip Dysplasia. The coat of the Mudi is straight, short, and smooth on the front of the legs and head. The coat on the body is dense, shiny, very wavy, or slightly curled. The coat is longest on the back of the legs and upper thighs where there is pronounced feathering. The Mudi breed is highly intelligent, obedient, and independent. They respond best to firmness, fairness, and consistency. The Mudi excels in agility, security, narcotics dog, and rescue. A very active breed, the Mudi does best with a large yard or rural setting. They thrive on working, exercise, and enjoy flyball and frisbee.